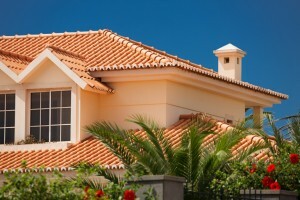 Tile roofing in Tampa, FL and Odessa is one of the more permanent roofing materials available. In fact, because it won’t burn, rot, and is insect resistant, it usually lasts 40 to 50 years or more. It requires minimal maintenance and comes in a variety of styles, colors, brands, and shapes. Even though the tiles are heavy, they are delicate; just walking on them can cause them to break. That can make it challenging to accomplish routine maintenance such as painting, cleaning rain gutters, or maintaining fireplaces. The highly qualified team at Dynamic Roofing Concepts is expertly trained on installing and maintaining tile roofing. There are different many styles of tile roofs to create unique and interesting rooftops, such as flat, Roman, S-shaped, and vertical. Tile roofs are easy to install when utilizing the services of a professional roofing contractor in Clearwater and Carrollwood. Contractors are rigorously trained on the proper installation and code-approved technique for installing tile roofing. For outstanding, certified tile roofing in Tampa, FL and Plant City, home and building owners rely on the experts at Dynamic Roofing Concepts. Contact us today at 813-257-9355 to schedule a free estimate.